We have performed Arras Coin Wedding Ceremonies. Officiant Guy, a wedding officiant in Los Angeles, performs many coin ceremonies and helps couples with a Southern California marriage and issues CA marriage licenses as well. A Coin wedding is usually a Latin tradition going back to Spanish and Roman days and is also referred to as Las arras or Las arras matrimoniales. During the coin ceremony, or arras ceremony, the groom drops 13 coins into the bride’s hands representing her dowry and his vow to support her. By some it is thought that the thirteen coins symbolizes Jesus and the twelve apostles. By others it represents the twelve months of the year and the the couple’s honeymoon. Some people think that it represents 13 core values shared by the couple. It’s still a deeply entrenched tradition nonetheless. Sometimes a Filipino tradition is that the ring bearer will also take down the aisle the coins in a coin purse, on a pillow or an ornate box. The wedding minister will then say a blessing, wishing them prosperity. He then gives the coins to both the bride and groom, usually pouring the contents of the purse or box into the bride and groom’s open palms. “These 13 coins traditionally represent the promise of the groom to support his wife and the wife’s dedication to her husband. But today, more than this, it represents that GROOM and BRIDE are united in love and harmony. I, GROOM, promise you that I will love and support you forever. I, BRIDE, promise you that I will love and support you forever. 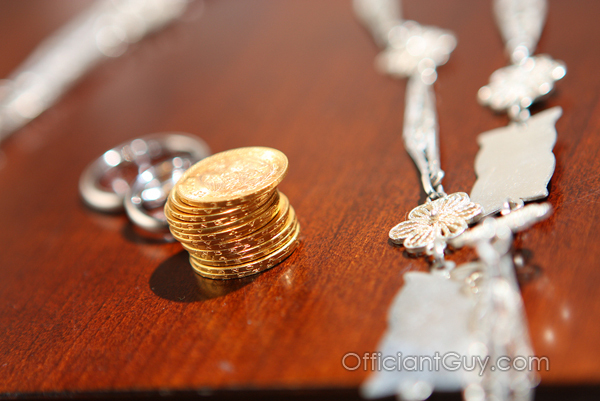 Either way that you want to do a coin wedding ceremony, the Officiant Guy can officiate it. If you are getting married anywhere in LA County give the number one ceremony officiant in Los Angeles a telephone call at (310) 882-5039 or (562) 547-3255 or fill out the contact form. Officiant Guy is a Southern California wedding minister for ceremonies. He has been performing wedding ceremonies and issuing confidential marriage licenses for over two decades.